My Food Roundups are including more going out meals lately, though I'm going to be cooking more, soon! Sometimes you need a little break, you know? I'm actually really excited because for the month of April, I'm going to be cooking from Vegan 101, a cookbook by cooking school Spork Foods! I will be posting on Instagram, both on my feed and some things just in my stories (if they don't come out too pretty), so you can expect a lot more home-cooked recipes in my food roundups soon. For now, here are some delish eats I tried in February! Scoops Westside has both nonvegan and vegan options that change daily! You can see what the flavors of the day are on Twitter. I have to be honest- they don't always knock it out of the park for me! And I always seem to want ice cream on Sundays, which is the day they aren't open. I think from now on, I will stick with their Oreo flavors- they often make salty Oreo, Oreo mint, things like that. I do really appreciate that they make their ice cream so fresh, and that they keep things new and exciting! On this day I got the mint coffee and apricot chocolate flavors, and I didn't think they were the best I've had. Oreo next time! I'm so lucky that my comedian friend Ashley Baca thought to invite me to this screening! Jon Mancinetti created a short film about his experience fostering pitbulls, and had this event in the Palisades at a beautiful home, with catered vegan food, dog kissing booth, DJ, and more. I loved the jackfruit sliders, and big pot of chili with toppings bar. The film was sweet, the food was delicious, and if you know me at all, you know that I am my most happiest when I get to be in a beautiful home. The funniest part? My mom had invited me over for dinner that night, and I told her I was busy doing something else. Turns out, this event was down the street from her! So Ashley and I drove down the street for the "afterparty" at my mom's. Everyone loves my mom, so it was really great to bring Ashley over and all hang out. Carrera Cafe is an Instagrammer's paradise. Not only is it across the street from the famous pink Paul Smith wall, but it also has a has a wall that gets repainted with various murals, is super cute inside, and makes photos in the foam in your latte (but only if you use whole milk, unfortunately). They also sell Yvonne's Vegan Kitchen gluten-free cookies! This place has so much to offer, and is right in the middle of the action. Check out Carrera Cafe if you haven't already! Fonuts donuts, which has some vegan options, has a very sweet, moist, cakey donut. When I went to Carrera Cafe, I tried the vanilla cake one with sprinkles. Admittedly, Fonuts are not my favorite donuts in LA, but also admittedly, we are incredibly spoiled here, and these are still delicious! I really appreciate that they are offering their goods at coffee shops like this one- because who wouldn't want a vegan donut option wherever you go? I would definitely get this again at Carrera Cafe. I LOVE me some Ethiopian food, so when I was asked to join Jane Velez-Mitchell and friends for a lunch and live show at Rahel's, I jumped at the chance! We filmed Jane's lunchbreakLIVE show, enjoyed a meal, and even had a traditional coffee ceremony! (Click here to read a blog post specifically about the coffee ceremony!). 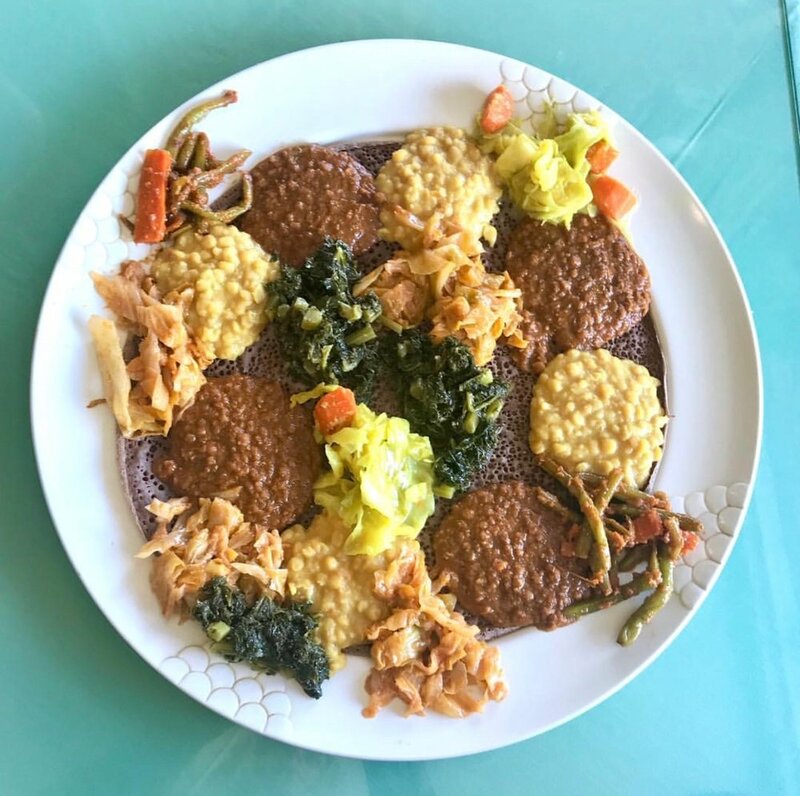 If you haven't tried Ethiopian food yet, it's a bit like Indian cuisine, but you use Injera bread, a spongy bread, with your hands, to pick up the food. Rahel's is bright, spacious, has a great buffet, and just makes you feel really healthy when you eat there. It's so cool to try vegan versions of different cuisines! I hope you enjoyed this latest installment of food roundups, I'll be back soon with more since I'm a bit late on this one!